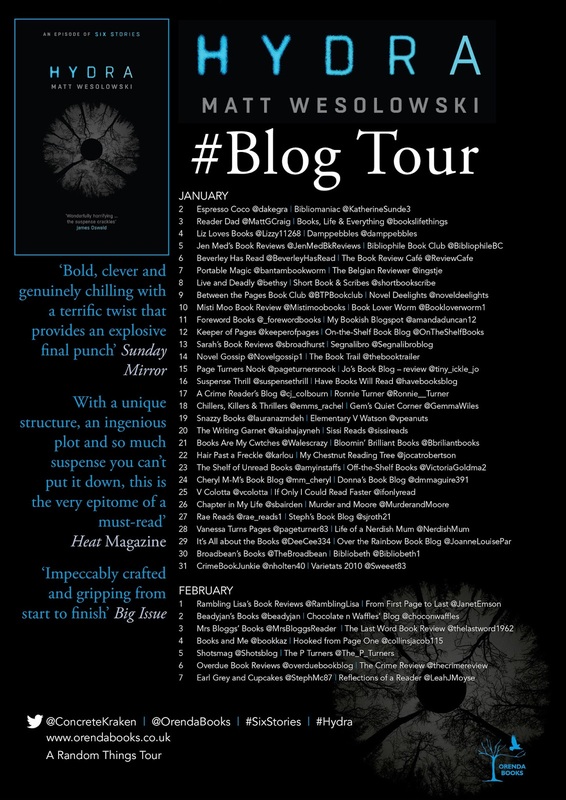 I don't think I can put into words, just how excited I am to be part of the blog tour for Matt Wesolowski's newest novel, Hydra. I absolutely loved Six Stories, so jumped immediatey at the chance of reading more of his work! One cold November night in 2014, in a small town in the north west of England, 26-year-old Arla Macleod bludgeoned her mother, father and younger sister to death with a hammer, in an unprovoked attack known as the "Macleod Massacre." Now incarcerated at a medium-security mental-health institution, Arla will speak to no one but Scott King, an investigative journalist, whose Six Stories podcasts have become an internet sensation. King finds himself immersed in an increasingly complex case, interviewing five witnesses and Arla herself, as he questions whether Arla’s responsibility for the massacre was a diminished as her legal team made out. 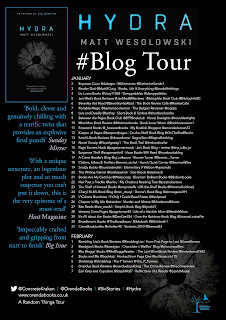 As he unpicks the stories, he finds himself thrust into a world of deadly forbidden "games," online trolls, and the mysterious Black-eyed Children, whose presence extends far beyond the delusions of a murderess. Matt Wesolowski is officially a genius. The way he crafts and weaves his stories is just, well....genius! 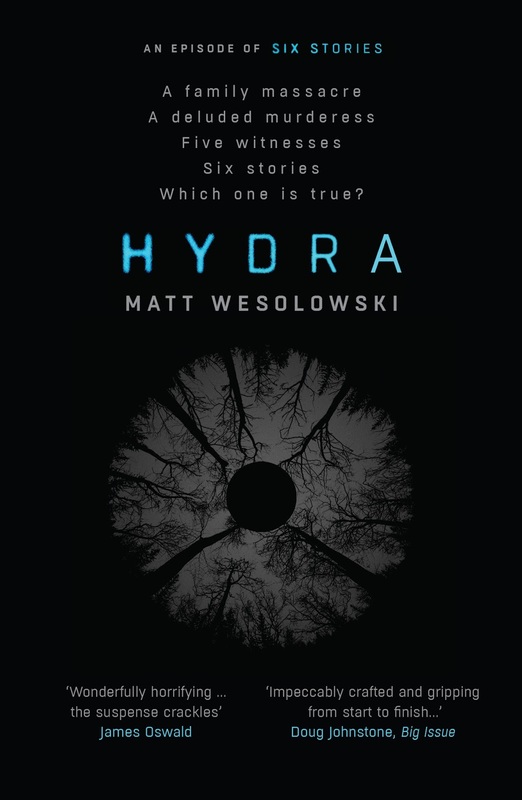 I didn't think you could get a better book than Six Stories and then out came Hydra and proved me very wrong. Telling the story through podcasts is such a modern and unique way of storytelling and it really lays everything out so nicely for the reader. The writing is so exquisite that you feel like you are actually "listening" to a podcast instead of reading it. Scott King is an extremely interesting character in himself and I enjoy the way he goes about investigating cold cases, not necessarily to solve them, but to try and shed more light on them. Its definitively something I would listen to in real life or watch a documentary on. I won't touch on the plot as to do so would be to take away any new readers discovery of the twists and turns throughout. 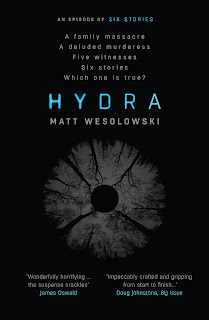 I will say however that you can really feel Wesolowski's origins in horror as Hydra is extremely creepy and gave me chills throughout the book. The story is fresh and full of surprises and I really enjoyed trying to discover the why of the horrendous crime that had occurred. Without gushing too much more, all I can say is go out and buy Six Stories and Hydra and read them immediately, you will not regret it! I gave this book ALL THE STARS! Matt Wesolowski is an author from Newcastle-Upon-Tyne in the UK. He is an English tutor for young people in care. 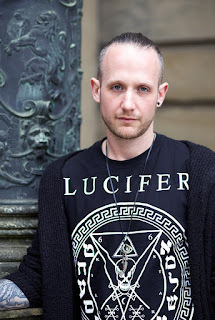 Matt started his writing career in horror, and his short horror fiction has been published in numerous UK - and US - based anthologies such as Midnight Movie Creature Feature, Selfies From The End Of The World, Cold Iron and many more. His novella, The Black Land, a horror set on the Northumberland coast, was published in 2013. Matt was a winner of the Pitch Perfect competition at Bloody Scotland Crime writing Festival in 2015. His debut thriller, Six Stories, was an Amazon bestseller in the USA, Canada, the UK and Australia, and a WHSmith Fresh Talent pick, and film rights were sold to a major Hollywood studio.